Raise your hand if you froze some cranberries after they were on sale this holiday season and don’t know what to do with them. C’mon, be honest. Yeah, that’s what we thought. 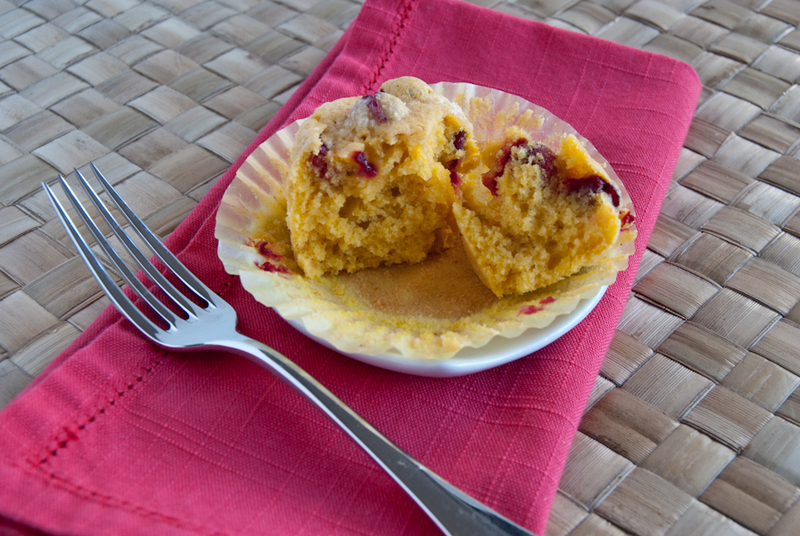 Here’s a great muffin recipe that’s not just for cranberries and pumpkin puree. You can ditch the pumpkin altogether and add in blueberries for the darned tastiest muffins you’ve ever eaten. The base recipe is from Stacey’s grandmother, “Big Mama” Tillie Singer, so you know who to thank when you enjoy the awesome muffins. Sift 2 c. flour, 2 tsp. baking powder and ½ tsp. salt. With mixer, cream ½ c. butter and 1 ¼ c. sugar until fluffy. Add 2 eggs, one at a time. Add flour mix alternatively with ½ c. milk. Add ½ c. pumpkin if desired. Gently add 2 ½ c. berries. Fill cups ¾ full. Sprinkle sugar on top before baking bake 25-30 minutes or until lightly browned. Ah, cranberries. If you haven’t received the message from the Ocean Spray commercials, then allow us to enlighten you. As with other richly colored fruits and veggies, it’s all about the antioxidants. We’ve highlighted many an antioxidant containing food on this blog, and thought it was time cranberries received the spotlight. These plump red berries are often forgotten most of the year, or only considered as a juice, or in many cases, a “cocktail” or beverage pretending to be juice. Cranberries offer a great source of fiber and Vitamin C, but if it’s the juice you prefer, double check the label for 100% juice. While you’ll cut down on delicousness, you can lighten the recipe by using less butter and sugar. You could also mix up your antioxidant combination by using other berries. How Stacey Got the Shot: On the dining room table with foam core backdrop and linens purchased at the outlet just for food photography ventures. Natural light, ISO 100, focal length 32mm, f/8, 1/20 second shutter speed. "Big Mama Tillie's Muffin Recipe"
We’re KNOT kidding, these homemade pretzels ROCK! These looks delicious. Sounds like a something for Sunday morning!